Carolynn Rowland. Photo courtesy of Rowland. Gunn hosted the hit television show, Project Runway, and would often use that phrase (which became his tagline) with contestants. Saying this, he most often wanted them to think broadly, creatively, optimistically and outside-of-the-box. Carolynn Rowland, marketing coordinator for Só Dança, presents a similar attitude in regards to making life in the dance world work; probe what’s possible, don’t be afraid to draw outside the lines, and redirect rather than give up. Here, learn howRowland shifted her career yet still remained working in dance, the gifts that dance training can offer for other endeavors, the importance of getting an education and more. What has been your journey in the dance world? “My ballet journey began a bit later than most due to the fact that I did not start classically training until I was almost 13 years old. My first classical ballet school was in Fort Lauderdale, Florida, at Magda Auñon School of Classical Ballet. Training with Magda opened the doors for me to attend the Next Generation Ballet in Tampa, Florida, under the direction of Peter Stark. I was always intrigued by the Balanchine style, and therefore dreamed about attending the School of American Ballet. With all of that being said, the Next Generation Ballet was the perfect place for me because it was a stepping stone school. Peter, along with the other teachers, had a plethora of knowledge about other styles of ballet. This really boosted my level of talent to eventually audition for SAB that following summer. What personal qualities and what kinds of choices helped these opportunities come to fruition for you? “Given the fact that my ballet education was a bit delayed, I always felt as though I had to prove everyone wrong, I had to be the exception, and I had to work my absolute hardest to be the best I could be. Moreover, I realized early on that I was my biggest hindrance, and once I pushed past the fact that I was (and am) imperfect, that was when I found the most freedom and liberty in my art form. A time off from dancing (due to injury) truly prepared me for my long-term business goals. I buckled down and focused on academics and expanded my horizons in the visual art realm. As a matter of fact, I would bring my school work to the Metropolitan Museum of Art so I could study in an inspiring setting. Whenever I was there, I would always bring my sketchbook and draw my feelings and surroundings. It was my escape during a difficult injury. Instead of crossing my fingers, praying my body would heal, I realized that life does not revolve around ballet. There were (and are) so many other avenues of work that I could pursue and still find a sense of fulfillment and joy. Do you think higher education dance programs help their students prepare for work in business or other high-performance careers? How might they do this better? 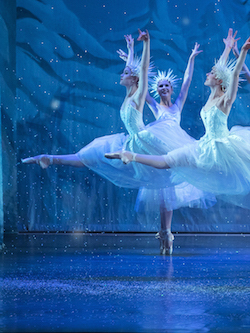 Carolynn Rowland in Los Angeles Ballet’ The Nutcracker’. Photo courtesy of Rowland. If dance students don’t find these opportunities in higher education, what other options might they find? For instance, might internships be useful in this regard? “Learning a skillset is wonderful, and an internship might foster an amazing environment for honing a new skill. What might you suggest for dancers interested in getting involved in dance-related businesses? How might one get a foot in the door, so to speak? What might you suggest for dancers seeking to be entrepreneurs? How would you advise dancers form their longer-term vision – career goals, and balancing performing and other endeavors? “I have found that in all companies, regardless of size, dancers’ rehearsal schedules vary in intensity. To be more specific, on some days during the season, you might just have company class and an hour rehearsal, but on other days you might be rehearsing or performing for a vast amount of time. These infrequencies in schedule, in my opinion, really allow for us as dancers to go out of our comfort zone and explore other avenues of work. I should mention layoffs. ‘Layoff’ is most dancers’ worst nightmare; in my case, I adore it! It has given me the opportunity to invest more in Só Dança, and Só Dança has, in turn, been able to invest in me. In regards to giving advice, my main takeaway token would be not to be afraid of being busy! We are only young and vibrant for so long; take advantage of your youth. 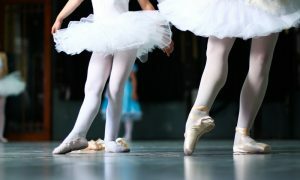 Use the beginning of your ballet (or any other dancing career) to kick start your long-term goals. Know exactly what you want to do, and make it happen. As dancers, we have been trained at such a young age to be disciplined. Take that practice and apply it in a ‘normal’ workplace.